Where to go with a group of over 300 staff for the annual work party, when you want to offer something a little different but not too challenging, relaxing but structured, where everyone leaves having had a good time but where the managers have achieved their work goals too? Increasingly more companies are looking for a brief along those lines. For something different from the year before, that is fun and exciting but, of course, within budget. It can be difficult to find large overnight venues that have the same creativity as more boutique or smaller venues, or where you have the privacy for you and your team to unwind carefree. So what do you end up doing? In 2016, retail brand Superdry had this predicament. For their Annual Global Store Manager Conference, they wanted to do something different to previous years and more in fitting with their brand. They were looking for a place where they could get some work done in the morning, for their global store managers to spend time together, to have fun and experience something unique as a team. We presented them with the idea of a festival style two day stay in the fields at Pennard House, where they’d shun the restrictions of bricks and mortar and cross over into a world with canvas overhead and grass underfoot. 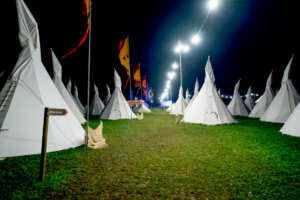 Having hosted many a tented village at Pennard, and the closeness to the Glastonbury Festival site, it was a great opportunity for us to show them what a country house in Somerset could offer. For some it was a first time experience away from the hairdryers and the wifi, for others it brought back fun memories of past music festivals. As it turned out they were a very upbeat, positive bunch who embraced everything we gave them. Here is how it panned out. To feed 300 people could take a couple of hours. And you know what it’s like when you see someone eating and you have to wait before your turn: torture. So we erected a one size fits all catering tent to feed everyone at once and allow them to get on with the rest of the day’s plans. 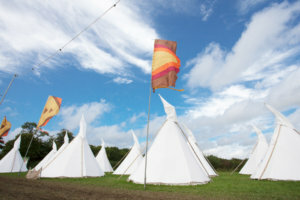 All 300 slept in our 16 foot canvas tipis, that come with real beds, fresh linen and woven coir floor mats. We had plenty of loos and nearby showers to help everyone feel a little refreshed after their sleep. 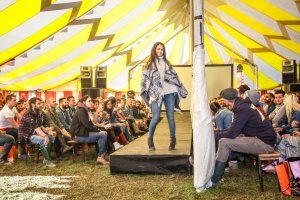 We had other tents for the morning’s workshop sessions, which doubled up as the fashion show venue and the music tent after dark. 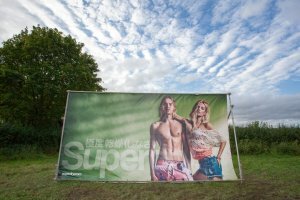 As a retail brand with plenty of visual content available, we had a few Superdry campaign images on large stretched vinyl screens that helped personalise the event, inspire the staff and even perhaps add at least a reminder as to why they were all there! 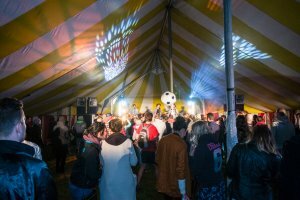 A festival style party wouldn’t be the same without flags, festoon lighting, fire pits and a solid night of music, DJs and the compulsory Somerset cider. If it wasn’t for the looming sight of Monday, I’d say these revellers could have carried on for days! 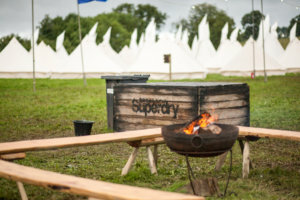 We had a fantastic time hosting Superdry. It was a great way for their employees to come together without any other work distractions. There was a really good atmosphere over the two days which made the ‘working’ part a lot of fun too. 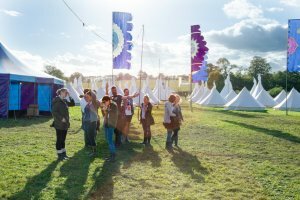 If you’d like to host a festival style event and are looking for a venue to partner up with, let us know. We’re always open to ideas, however large or small so please do contact us here and let us know what you have in mind.